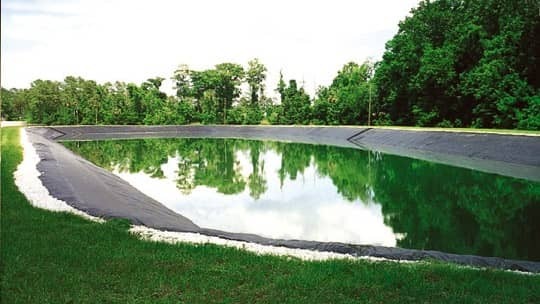 XR®-3 geomembrane fabric was chosen by engineers in Winer Springs, Florida for an effluent holding pond liner due to its ability withstand the heat and constant barrage of sunshine. Location: Winter Springs, Florida U.S.A. The ability of XR®-3 geomembrane fabric to withstand a constant barrage of sunshine and heat in Florida provided the ideal solution for engineers constructing an effluent holding pond for the city of Winter Springs, Florida. Located just north of Orlando, the city had experienced tremendous growth in recent years and had the urgent need to bolster the capabilities of its wastewater treatment system. Previously, several HDPE installations had experienced cracking because of the environmental stresses, including the summer sun in Florida. Therefore, a better solution had to be found. Conklin, Porter and Holmes Engineers, hired to design the new system, evaluated a variety of pond liner materials and chose Seaman's XR-3 for its proven combination of high strength, low thermal expansion/contraction properties and UV resistance. A 30-mil non-reinforced XR-3 geomembrane was used to line the pond bottom, while 30-mil reinforced XR-3, with extra tensile strength, formed the side slopes. XR-3 geomembrane is ideal in all types of UV exposed lining applications including wastewater and stormwater impoundments, mining projects and bio-remediation projects where chemical resistance requirements are moderate.